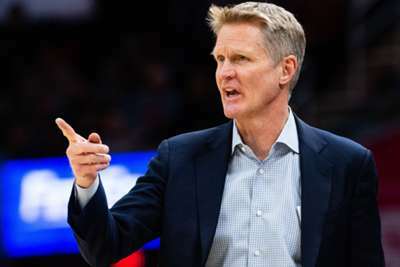 Golden State Warriors coach Steve Kerr admitted Kevin Durant "took the bait" after he was ejected following a running battle with Patrick Beverley on Saturday. 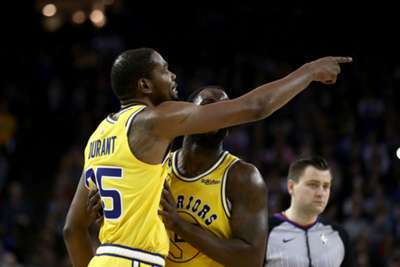 The duo were ejected from Game 1 of the playoff series in the fourth quarter, having received a pair of double technicals after repeatedly going at each other during proceedings. Beverley has a reputation in the NBA for trying to fluster opposing players and Kerr revealed he had warned the Warriors about rising to any provocation against the Clippers. However, Durant failed to keep his cool and with two technicals to his name already he runs the risk of a one-game suspension if he draws five more during the postseason. "We took the bait," Kerr said following a 121-104 victory for the Warriors. "He [Durant] took the bait, and that's two technicals. "You get seven technicals, your seventh one is a suspension in the playoffs. Whether you play four playoff games or 24, seven is the magic number. So he's got four to play with after one game. "That's what Beverley does. We talked about it for the last couple days. He's a hell of a defender, he plays hard, we've got a lot of respect for him - but you cannot take the bait because that's a bad trade for us. "The Clippers have made a lot of good trades this year - that was probably their best." Clippers guard Beverley insisted he was "just being Pat" out on court and enjoyed the exchanges with Durant, who had 23 points before his early departure. "I was just being Pat. It was fun out there," Beverley told the media. "We competed. I really wish we could've played more without the chippy calls, but I understand it's the first game and they're trying to set the tone. "But this is the playoffs. People want to come see a good basketball game and not so many fouls, but there's things that we can control." The teams are back in action again at Oracle Arena on Monday.